I told y’all last week that 1984 had catapulted to the top of Amazon’s bookstore. Well it’s still there. And it’s been followed by a number of dystopian classics that people feel may give them some insight into what’s happening today. It Can’t Happen Here. The Origins of Totalitarianism. Brave New World. Fahrenheit 451. Animal Farm. One might say these books are always selling fairly well. Sure. But not thousands of copies that are required to stay in the top 10 on the website for several days. Have you had any thoughts to read any of these books once more? I have. I own two of the titles mentioned and read 4 of them. I wrote recently about who I’d like to see write a book. My choice was Katie Nolan. I think people would call her a sports personality, but I said before that she isn’t afraid to express her opinion on a wide range of topics. Turns out the week before the Super Bowl has some perks. Sure there’s music, the NFL Experience, and other festivities going on this week in Houston. But Fox is also broadcasting several of its shows live from Houston. 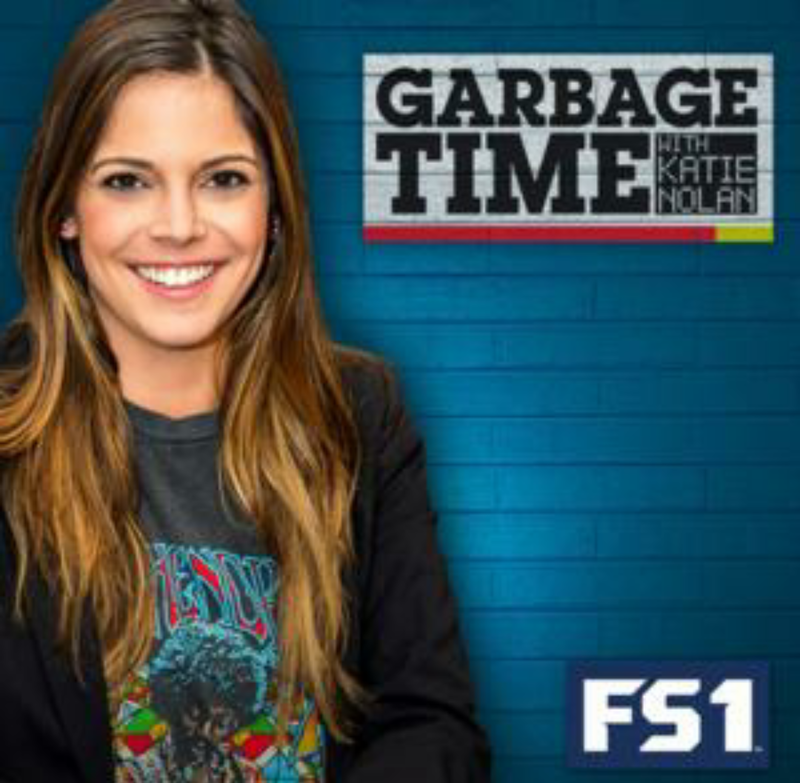 I’M GOING TO SEE GARBAGE TIME WITH KATIE NOLAN LIVE IN THE AUDIENCE TODAY. I’ve attended three concerts in my life and dozens of sporting events. This will be the first time I watch a taping of a show in the audience. And I’m excited! Which show would you like to see from the audience if you could pick any one? What Should President Trump be Reading? I’m no presidential scholar, but I can’t think of any president who was more literary-minded than President Obama. It’s a bit of a far cry from Trump. President Obama quoted Atticus Finch in his farewell address. But it appears more likely with each passing day that Trump has no desire to be friendly toward the arts. So I wanted to do something different today. Y’all know we can write letters to the president. I want book recommendations. I want y’all to tell me what you would recommend that President Trump read as he embarks on his journey as President. ANY book. I plan on sending a letter to the White House with every recommendation. I’ll start. I’ll recommend Night by Elie Wiesel. To show him that nothing good comes from persecuting a group of people. What would you recommend to President Trump? Saturday Selects is a series of posts I write that fall outside the general bookish theme of the blog. Donald Trump signed an executive order yesterday banning immigrants and refugees from seven countries. Syria. Iran. Iraq. Libya. Somalia. Yemen. Sudan. He’s done this under the guise of national security, claiming that this action is meant to protect us from terrorists. But it has been widely reported by multiple reputable news outlets that no attack carried out on US soil since 9/11 involved someone from any of the countries. Makes you wonder what the hell is actually going on, right? If we’re banning people from our lands under a false pretense, then what’s the real reason for the ban? I’ll tell you, but I think you already know. One of Donald Trump’s major campaign promises was some form of a ban on Muslims entering the country. He’s making good on that promise. The United States has failed all refugees. We have resources and the ability to take in many refugees, but we don’t. “The greatest country in the world” has all but refused to lend its hand to refugees all over the world. Refugees are escaping war, persecution, and tyrannical governments. Are these not the people we want to stand up for? Are we content just standing on the sidelines as the refugee crisis in the Middle East and Europe only worsens? Is this really the American way? Donald Trump is not putting America first, as he likes to say. He’s putting America on an island while the rest of the world backs away from us. Roxane Gay is a bestselling author you may have heard of. She did something recently I can only respect and applaud. She has a book forthcoming through Simon & Schuster, as does Milo Yiannopoulos. I understand there’s a real chance you’re unfamiliar with either name. Milo is a leader of the alt-right. Just think of extreme, extreme conservativism. The group had no issue with any of Trump’s remarks heading into election day. So as Roxane Gay was preparing to send off her book to be published later this year, she didn’t. She held on to it rather than send it off to a publisher willing to give Milo a larger platform for hate speech. Her words not mine. She’s not the only one with concerns. Other authors forced Simon & Schuster to release a statement on the publishing deal inked with Milo Yiannopoulos, but as of yet no one else has taken the action to pull their book from the publisher. We all know people can say and do whatever they want to. That’s not what this is about. It’s about the platform being offered. At some point someone along the line has to say enough is enough. That they respect his right to his opinions, but the company believes there to be a better fit for his voice elsewhere. Instead they reportedly gave him a $200k advance. Simon & Schuster dropped the ball. And now they’re paying the price. Stand up for what you believe in just like Roxane Gay and Milo Yiannopoulos. We all should. But the United States is no place for hate. Becoming a bestseller is not an exact science. Sometimes Oprah will mention a book and sales skyrocket. Or an adaptation causes a surge. But what about a book published decades before that sells well throughout each and every year? Not bestseller well, but well enough to require reprints fairly often. You know the books I’m talking about. Classics widely read in classrooms all over the country. It turns out that current events can also cause a book to jump off shelves if people believe it may have some resemblance to what’s going on in the real world. Enter 1984. It’s the top selling book on Amazon right now because many believe we might be entering a world not much different from what Orwell describes in the book. I’ve read it. But I think a reread may be in order. Perhaps I’ll take a page from Kellyanne Conway and start using alternative facts to describe things. Have you read Orwell’s 20th century Classic? See any resemblance to what’s happening right now? My first foray into the world of Toni Morrison is probably her most known work, Beloved. The book tells the story of the African-American experience both during and immediately after the end of slavery. It’s fictional, but just like in Things Fall Apart this story could have been written about a real family or group of slaves because it describes events and circumstances we are all aware of. So take a few minutes to see what I thought of this timeless classic and let me know what you thought! The book satisfied the requirement to read a book written by a woman for my 2017 Reading Challenge and is also one of Amazon’s 100 Books Everyone Should Read. This was the fourth book I’ve read from my challenge.